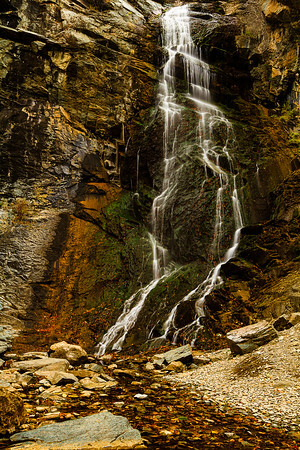 The three big landscape photographic attractions for this visit were waterfalls. Yes, there are waterfalls in South Dakota. The first waterfall we visited during our photo weekend (Oct 15-18 2011) was Roughlock Falls. There are a couple of spots overlooking the falls from the top and a walkway to get below the falls. At Savoy, SD, there is a turnoff to a gravel road from the highway to get to the falls. We arrived before sunrise (the falls face southeast) before the sun comes up over the canyon walls. I used a polarizer filter to help slow down the shutter speed and to remove any reflection from the water (my shutter speeds were from 0.3 to 3.2 seconds). I wanted to capture the small white water in front and the Roughlock falls in the background. Unfortunately, it was past the peak fall color season. It would have been nice to get there at the end of September to capture that color and the falls together. I used two different lens at Roughlock Falls, the Canon EF16-35mm f/2.8L wide angle Lens angle and the Canon EF 70-200mm f/2.8L Telephoto Zoom lens. 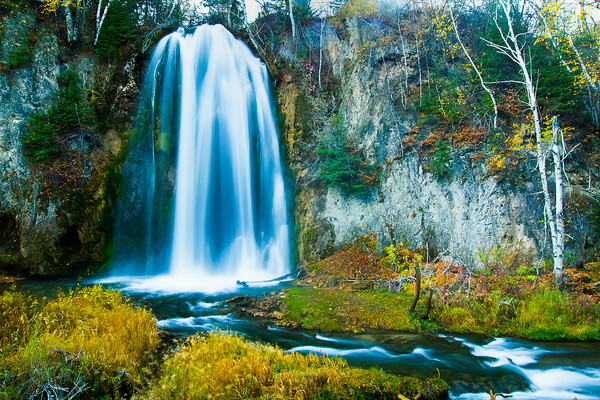 Another waterfall - Bridal Veil Falls, flows off the canyon walls between Savoy and Spearfish. There is a pull off area on the west side of the highway which many visitors use to view the falls. You can get a nice shot of the falls from the road with with some trees acting as a border to the falls but we climbed cross Spearfish creek to get closer to the waterfall. We arrived at the Bridal Veil Falls at the end of the day’s light. When you are up close to the waterfall, you need a wide angle lens (Canon EF16-35mm) to capture the entire falls (50 feet) in a single shot. As before, I used my polarizer filter and tripod shooting 1-2 second shutter speeds. To capture the entire falls, I found the best location was right in front of the falls standing in the run off. I found I really liked the top section of the falls and used my Canon 70-200mm Telephoto Zoom lens to capture the top part of the Bridal Veil Falls. The last waterfall we visited, Little Spearfish Falls, was close to Roughlock Falls just off the highway. It is a short walk from the highway to the falls and you will be surprised by how close the falls is to the highway. The waterfall is about 80 feet and you can see the entire falls from the trail. We arrived before the sunrise to be able to photograph the scene before the sun hit it. I wanted to capture the waterfall with as many fall colors as possible and of course with the silky smooth water using a slow shutter speed and a polarizer filter. I minimized the sky in the photo since a slow shutter speed would blow out the sky. The other challenge was the falls looks like it falls from the sky so the waterfall had to start near the top of the photo. I also tried to show the water flowing from the falls along with the colorful grass on the water’s edge to provide some depth. Little Spearfish Falls throws off a mist that could be felt all the way to the other side of Spearfish Creek. Shortly after the sun came over the canyon wall, the interaction between the sun and the mist made for a most interesting effect. (Remember to bring a cloth to clean off the lens). My photo partner, Sean Key, captured a nice photo in that that light. Spearfish Canyon had a lot of beauty to photograph. 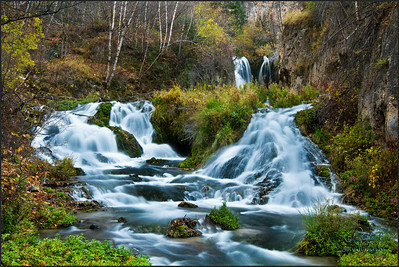 Even though I live in Colorado, Spearfish Canyon is a top choice for me to shoot.